Surrounded by the city walls from ancient times, the old city, Paris, is filled with history and culture. It is not as clean or safe as one might think, but I am in love with Paris. It has so much more to offer than just caffé lattes, croissants and macarons! When we arrived, I was swooned by the old style buildings and clear blue sky. I guess Tromsø’s long polar night had an effect on me! As soon as the sun kissed my skin, I think I literally shed a little tear of joy. Our little Airbnb is located in République (10th Arrondissement). With a wide variety of restaurants, shops and bars along these streets, it is a very nice and hip area to stay in. The Metro makes it very convenient for us to easily get from one place to another. To save money, you can purchase a carnet of 10 tickets for €14,50 from vending machines near the turnstiles in Metro stations. With this single ticket, you travel anywhere within the city of Paris on the Metro or RER networks (you can even transfer between lines). 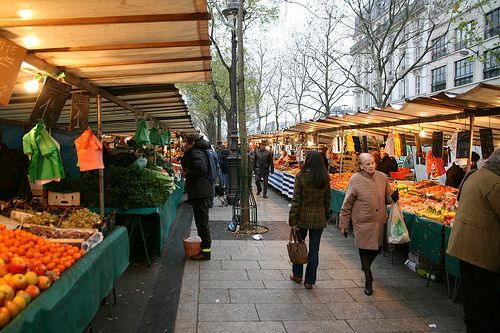 One of the best farmers’ market, Marché Bastille, is located just a quick 15 minutes walk away from our Airbnb. It has a wide range of amazing local cheeses and beautiful baskets of fruits! Some stalls even offer cheap jewellery, clothes and bags. Not everything is a bargain, but it is a place for foodies such as ourselves! If you’re lucky, you can even catch talented street performers near the Place de la Bastille. If you love classical music and beautiful stained glass churches, this classical concert at the royal chapel La Sainte Chapelle would be an unforgettable experience. In addition to its rich history, this beautiful Gothic architecture has such amazing acoustics! We were floored by the Vivaldi’s Four Seasons performance. Look out for their other concerts, and try to visit during the day time so you can see the magnificent stained glass walls. This iconic building has endless choices of perfumes, make up, clothes and shoes. Even the architecture is amazing! The dome itself is a piece of art with intricate details of the stained-glass cupola. Needless to say, I bought a really nice beautiful black wool coat from there on a sale! Step aside Eiffel Tower! Can you spot us standing on this beautiful steel bridge where they filmed Inception in 2010? You can easily walk from Bir-Hakeim Metro station to this bridge with views of the Eiffel Tower and the banks of the Seine. It has metal columns with lines of art-deco street lamps, making it a popular place for couples (such as ourselves) to have their photos taken. It turns out, what Audrey Hepburn said is so true! Paris is always is a good idea. Share with us your favourite moments so we can experience it for ourselves when we visit Paris again!